The five chickens we hatched out earlier this year are almost ready to go off to their new home. I'm giving them to mum and dad to replace theirs who have stopped laying now due to old age. I dispatched these old ones on Friday - never a job I like but one that sometimes needs to be done. These hens were hatched at the right time so they should lay through the winter. They've been housed in their ark but I've added some panels (tied with good old fashioned baler twine) to give them plenty of fresh grass. They're quite a feisty bunch and need the space. From the landing window the way I've set the panels up looks like a love heart - my wife thought I was being romantic! I didn't have the heart to tell her it's because I set it up in the dark! Next year I'm going to work on having some spare coops to make sure when we hatch out more hens there's plenty of options on where to house them. How does everyone else come up with temporary housing and pens for animals on a budget? rabbit hutches in need ot TLC. We sacrificed one (the worst one) in order to mend the others and covered the wire door up. The rabbit sleeping bit became the nest box. We made runs from odd bits of wood and wire. 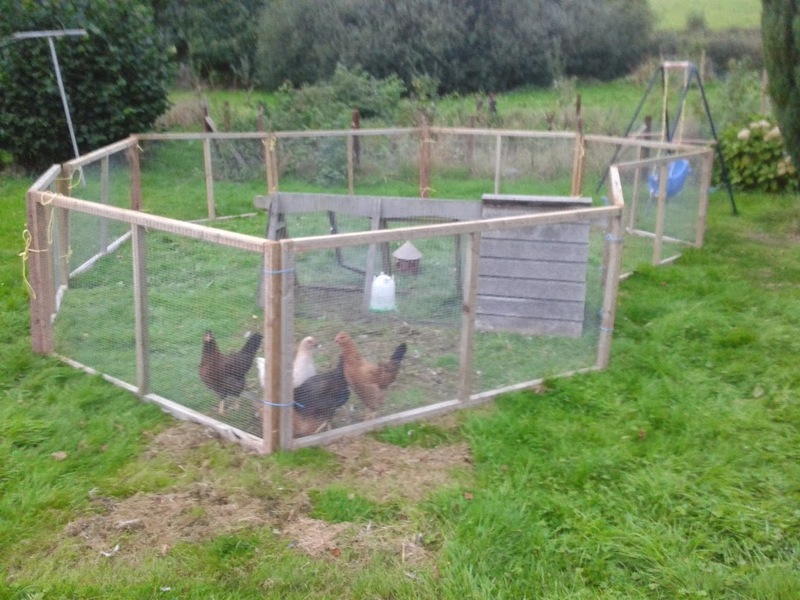 Total cost was negligible but the hutches do a brilliant job. Rabbit hutches are a good idea (and I turned one down the other day!) I did get given a half reasonable coop the other day though so I can't complain! A trip to the hospital today - only to get sent home! Maybe tomorrow! Hope all goes well with the transfer. Hope your new addition comes soon, too. Praying for all of you.